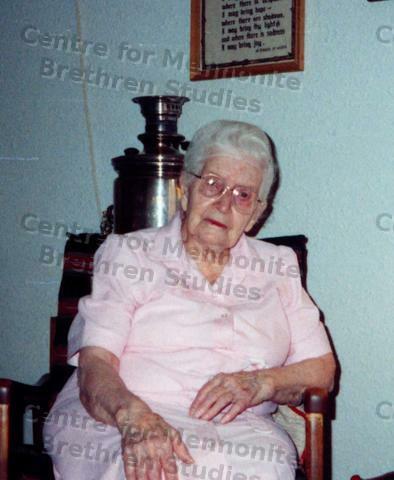 This is a photo of Anna Funk (nee Anna Janzen) in her later years [1993?] at her apartment in Edmonton. In 1921, during the famine, her wedding ring was sold for food. She never again wore one, saying she didn’t need a ring to hold her marriage together. Notice the samovar behind her, carried from Russia to Canada in 1923 in a tin cradle.